Apple and Samsung, for example, are betting on the wrist; Google, the face. A slew of tech companies believeclothing will simply become electronic. Yet there’s a whole new segment of start-ups that believe all of the above are destined for failure and that we humans will become the actual computers, or at least the place where the technology will reside. Many of these technologies don’t look anything like today’s gadgets. Instead, they are stretchable, bendable and incredibly thin. They can also be given unique designs, to stand out like a bold tattoo, or to blend in to the color of your skin. While these wearables raise novel privacy concerns, their advocates say there are numerous benefits. Attachable computers will be less expensive to make, provide greater accuracy because sensors will be closer to a person’s body (or even inside us) and offer the most utility, as something people won’t forget to wear. MC10, a company based in Cambridge, Mass., is testing attachable computers that look like small rectangular stickers, about the size of a piece of gum, and can include wireless antennas, temperature and heart-rate sensors and a tiny battery. MC10 recently teamed up with John A. Rogers, a professor of materials science and engineering at the University of Illinois at Urbana-Champaign, who has been working for nearly a decade to perfect flexible devices that can be worn on the skin or implanted internally. How would these gadgets work? Imagine being able to slap a few Band-Aid-size sensors to your body when you go for a run, then seeing a micro-level reading of your exercise on your phone. Maybe you want to figure out which deodorant would be best for you. This would be done with a sticker that tracks your sweat level, then emails you a few brand recommendations. Or if you want to monitor your baby’s breathing, you would stick a little sensor on the baby’s chest that will alert you to any problems. The health applications are enormous. Over the past year, Mr. Rogers and his team of scientists have been working with patients with Parkinson’s disease to monitor their motions, dermatologists to treat skin diseases, and beauty companies like L’Oréal to develop digital stickers that track skin hydration. Wearable-computer advocates are also giddy about the infinite style possibilities. “It turns out that the mechanics of these devices are 100 percent compatible with kids’ standard temporary tattoos,” Mr. Rogers said. 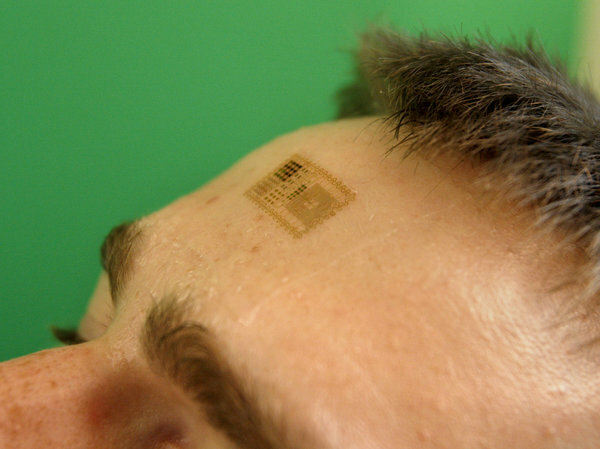 Meaning, they can be made to look like tattoos, with each segment containing different sensors. 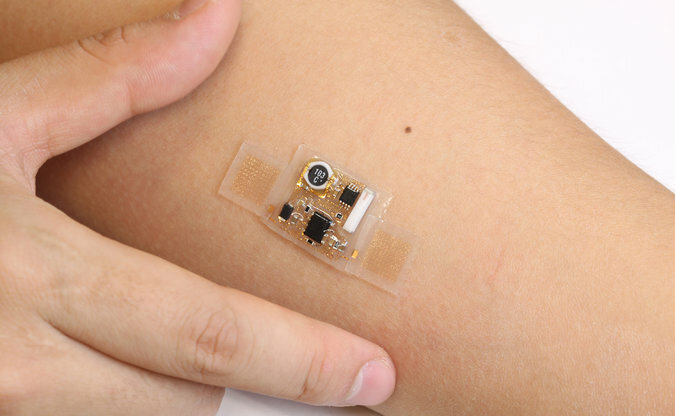 On a more futuristic front, scientists at the University of Tokyo have been working on an “e-skin,” which, as you may have guessed, is an electronic skin that sits on top of real skin. 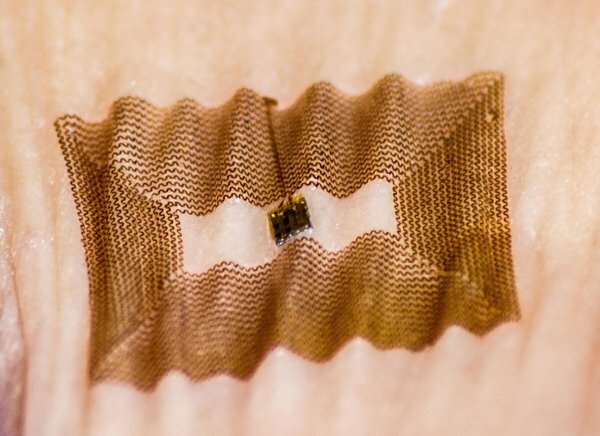 It looks like a flexible and stretchable sheet of plastic wrap, yet contains lots of health-related sensors. In another iteration of e-skin, scientists are working to add a layer of LEDs, turning it into a functional screen that sits on the body. But don’t throw aside your smartwatch or say goodbye to Google Glass just yet. It will be a while before our wearable future becomes known.